Sabre Wulf is considered one of the classic games from Rare’s early years as Ultimate Play the Game. 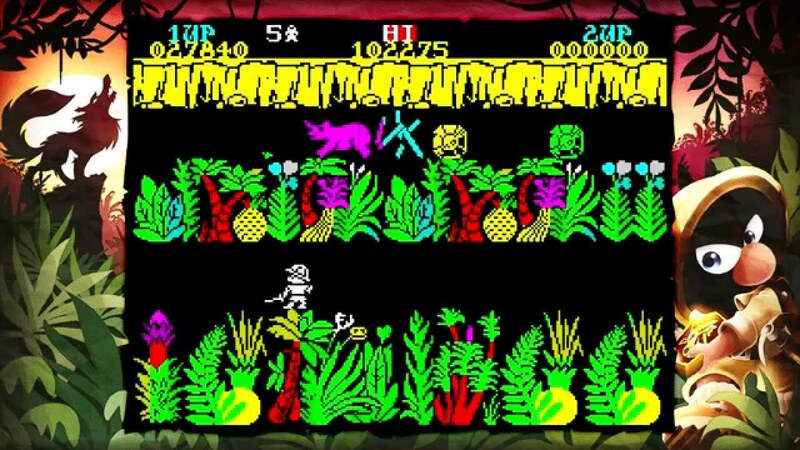 This 1984 ZX Spectrum title – along with Ultimate Play the Game’s previous title Atic Atac – helped influence many adventure games to come, as well as many of Rare’s own games down the line (Killer Instinct even includes a wolf character who bears the same name as this game). Though when playing Sabre Wulf today, it is obvious that it was a product of its time. While Atic Atic may be outdated in many aspects, it at least had some forward-thinking ideas at play that you can still appreciate today. In contrast, Sabre Wulf shares all the dated elements, without any of the “wow, that was clever” moments. Sabre Wulf uses the same basic structure as Atic Atac, with players navigating a labyrinthine maze world, and collect pieces of a special artifact to beat the game. In this case, the world is a jungle, and the items are pieces of an ancient amulet, with four pieces needed to bypass the guardian of a cave. Where Sabre Wulf differs from Atic Atac is in its character. While Atic Atac had three playable characters who could each find their own ways to traverse a haunted castle, here players have to make do with Sabreman, an adventure and treasure hunter. Sabreman doesn’t possess the kind of projectile moves as the characters of Atic Atac, and instead fights wild animals with a trusty sabre. Though this melee weapon is far less reliable than the spells and throwing weapons of Atic Atac, as Sabreman swings his sabre so erratically you have to have pitch-perfect timing in order to hit enemies directly in front of you (and even then, some enemies seem to ignore being struck by it, and good luck guessing which ones). Sabreman can also collect power-ups in the form of orchids, which can have positive or negative effects depending on their color. Blue orchids will make you zoom past enemies, while a red orchid will make you impervious to their attacks. Then there are purple orchids, which reverse the player’s controls. Honestly, there’s not a whole lot else to talk about. The maze-like world is incredibly confusing, and provides no hints as to what you need to be doing or where to go, thus leaving things to trial-and-error (trial-and-error which, I might add, you can’t even rely on, since the enemy spawns are random). The combat is unreliable and, frankly, pretty clunky. And in all honesty, the plinky-plonky sound effects (which return from Atic Atac) might drive you nuts after a while. Essentially, Sabre Wulf is like Atic Atac with a different setting. A different setting, and also the absence of the creative spark that makes Atic Atac worth a look for those curious in gaming’s early history. The different characters and modes of travel, and the survival elements of Atic Atac are gone. But the cryptic level design and objectives remain, and the gameplay’s worse. Maybe in its day, Sabre Wulf was influential. But there’s very little reason to check it out today other than pure curiosity. That seems to be a running theme throughout these ZX Spectrum reviews – good for its day, not so much now. Then again, that can be said for a lot of eighties games. I can see why they’re difficult to appreciate now when there are superior alternatives. Back in those days, the alternative was usually to play no game at all. I tried giving this and other early Rare games on the Rare Replay collection a go but a lot of them are incomprehensible at first glance and I don’t have time to devote to figuring them out.